If you’re ready to move to the next dimension of your destiny by fully pursuing God’s call on your life, it’s time to identify what exactly your calling and life message are. Let me say first that identifying your calling is a process. You start by identifying the framework of your call, but you get more and more specific as time goes on. So there’s no pressure. There’s no requirement to figure the whole thing out perfectly the first time you start praying about it. I do believe, however, that when you ask yourself and the Lord the right questions, you can immediately see what the bare bones of your calling will be. Identifying or finding your calling, and beginning to walk in it, is a lot like building a house. If you begin to build a house, first you pour your foundation. Then you frame it out, dry it in, and begin on the inside. But even when you start to work on the inside, you don’t start painting right away. You have to put in the wiring, plumbing, drywall, flooring, et cetera before you’re ever ready to start with the pretty stuff. The paint comes almost last, and the decorating IS last. First, you have to get a bare-bones idea of what your main purpose is. Sometimes you won’t know more than just the framework of your calling at first. Then, as time goes on, you start to get more and more of an idea. The bits and pieces come together as you grow and mature, and the strategies you need to carry out your purpose start to become evident one by one. The glitz and glam of the finished product come years after you began building your foundation. I know I am nowhere near anything called a “finished product,” but I began building a foundation long ago. I remember distinctly when God called me to preach. I was driving at the time, and I remember exactly where I was. I heard Him clearly out of nowhere. Then I remember when the Lord showed me what the framework of my calling was. I love seeing people get empowered. I hate pitiful, poor-mouthing attitudes. I want to help people grow and become equipped to live powerful lives in Christ. There is an obvious theme there, which told me that my calling has to do with empowering and equipping God’s people. Notice that that is kind of a vague framework—it’s like the foundation of the house—but it IS a great place to start. I made the decision to pursue God with all my heart. I found a good church and got plugged in, and that church remains my home church today. I submitted myself to godly authority. I sat at the proverbial feet of people much wiser and more mature than me. I listened and learned. I studied God’s Word, the Bible, on my own. I attended classes on hearing God, dream interpretation, prophetic evangelism, and everything else I could. Anyway, I won’t go on about that; but my point is, over time, the Lord has pulled me into whatever measure of my calling I’m walking in now—both in knowing what I’m called to do AND in actually walking it out. I have soooooooo much farther to go, but I could tell you a lot more about God’s call on my life now than I used to know. And with every year, every bit of growth, every new opportunity, the Lord has pulled me more precisely into my purpose than I was before. Well, are you ready to get started as well? It starts with identifying the theme of your calling. If you could spend the rest of your life doing or talking about one thing (and money were no object), what would it be? What kinds of things make you really excited? When do you feel most alive? What experience in your background has uniquely prepared you to communicate a message or do a thing that meets someone’s need? Figuring out what you love and what you hate is an important key to identifying your calling. What you hate is usually a thing you’re called to fix. What you love is usually the positive result of the thing you’re called to do. Notice I said WHAT you love and hate, not WHO you love and hate. Your calling will be about solving somebody’s problem or filling in a gap somewhere—NOT a personal vendetta against a person or people group. When you get these 5 questions answered, look at your answers as a whole. What are the themes? What similarities and contrasts do you see? In my personal example above, I LOVE seeing people walk in power. I HATE pitiful, poor-mouthing attitudes. The pitiful, poor-mouthing attitude is the opposite of a powerful life. So I’m called to do something about the one thing (the poor mindset) by helping people replace that poor mindset with the power of God’s Word. I also feel more alive when I’m preaching and ministering to people than when I do pretty much anything else. So you can see how the themes come together to form one life direction. Your calling may look much different than mine, and that’s ok.
You are unique. God made you unique because He needs you to occupy your unique spot in His Kingdom and in His Body. He gave you a unique calling and gifting. You, and only you, can fulfill the purpose and destiny that Father placed on your life. to heal people through the medical arts. Maybe you get absolutely fired up over starting a new business or helping people find jobs. Maybe you’re called to shine the light of Jesus in a Broadway play. Maybe you are called to make the world a better place by being a good, honest car mechanic or keep people safe by becoming a pilot. After you figure out what the framework of your calling is, pray into it and start exploring. If you start digging into something and you find that you hate it, and there’s no flow, you might want to go back to the drawing board. Ask the Lord if you simply need to persevere, or if you might have taken a wrong turn at some point. On the other hand, if you start learning about something and growing in the practice of it, and you love it and see the Holy Spirit clearly at work in it, keep pursuing it as you feel led. Watch for fruit–especially the fruit of the Spirit (Galatians 5:22-23). Where the Holy Spirit is, there will be fruit. Don’t put pressure on yourself to get everything right the first time. Let the Holy Spirit walk you through this process. He is your personal Teacher, and He can do a better job guiding you than anyone else can. 🙂 You can trust Him, and you don’t have to worry about missing your call if you’re seeking Him first. As you explore the framework of your calling, the bells and whistles will come over time. I am still identifying my life message. The framework of my call was about empowering people, as I described above. The next, more specific layer of my call–the drywall and plumbing of my house–is that I am called to preach, to write, and to minister prophetically. I know that my life message has to do with the message of Abba Father; that in Christ, we are beloved sons and daughters, not orphans. The first time I prayed for people to receive the love of Abba Father in a prayer line, the Holy Spirit wrecked me as much as He did them. I would give anything to see people receive God’s love. I also know that my life message has to do with the need for every Christian to become a spiritual father or mother, for that is the only effective way to make disciples. I’m passionate about mentoring and getting life-on-life with people like Jesus did. I know it has to do with prayer. God has forever wrecked me for prayer, and I believe that Jesus and prayer are the two missing ingredients in the Church that are keeping us from seeing true revival. And I know it has to do with “on earth as it is in Heaven.” This, after all, is the essence of God’s Kingdom. But I am still getting clarity, day after day, year after year, on all of the above. 🙂 And that’s okay. I know as much as I need to know for where God has me right now. And as He moves me forward, He will show me everything I need to know for the next place. It will work the same way with you. You’ll learn more about yourself and about what God has called you to do as you grow. Some things He has called you to do might not even be possible yet. Many opportunities He has for you aren’t even prepared yet. For example, when God called me to equip His people, blogging didn’t even exist. So if He had told me to blog at that time, I would have glanced heavenward and said, “Huh?” But the important thing was that, at every step along the way, He showed me what I needed for that place. God will do the same for you. He will show you what you need for each step along your journey. As you pursue Him and do what He tells you to do at each step along the way, He’ll personally bring you into the fullness of your calling. He’ll show you what your life message is, and help you narrow your focus as needed. Papa God has a very vested interest in you fulfilling His call on your life. You can trust Him. But that doesn’t mean you do nothing; if you’re reading this article, I believe it’s because the Holy Spirit is speaking to you about buckling down and walking intentionally into your purpose. So will you get alone with the Lord today and begin to flesh out the answers to the questions above? There’s no rush, but I know the Lord is ready to start talking to you about the next step. Does this message help you see a little better how finding your calling works? If so, please leave a comment below. I’d love to hear from you! Your comment, “the Holy Spirit is speaking to you about buckling down and walking intentionally into your purpose.” , hit me like a sledge hammer and I was directed straight to me. Thank you for letting the Holy Spirit speak through you to me. Jamie, this was exactly what I needed to hear today. God has been dealing with me on this very thing, to get back into place and do what He has called me to do, which is minister to others. So thanks for this!!! Definitely, some people are called into a specific ministry that can be categorized early in life. But I was led through situations that forced me to keep shifting my vocational focus. I held responsible jobs with titles, but nothing that I would equate with a “mission.” The emphasis placed by some preachers on other easily defined ministries made me feel isolated and diminished, even while I grew in knowledge and spirituality. Each job I held was God-guided and blessed. I was 66 years old before the pieces of a definable central mission came together. Only then could I see how every aspect of all those years of experience were leading to stunning discoveries about the origins of human behavior in the ear and how to heal learning problems and all forms of mental illness with music. No way could I have dreamed during those early years of following the leading of the Holy Spirit where my blind obedience would end up! Readers who are being led to “unsearchable” knowledge (Jer. 33:3) need to know that they might not be able to discover their “life work” immediately. However, every little decision made under the Lord’s direction is part of a much larger picture that also is under His control. You can trust Him to take care of His purposes for you, even if you don’t have a label to apply to your present calling, as long as you discern His will in each decision you face. 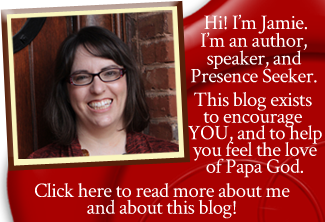 I love coming to your blog and seeing what the Holy Spirit and Papa God has to say to us all. I love knowing that this is a good and safe path to be on. Thank you. Thanks for this article of encouragement. I had to repent to the Lord for not starting to blog which was a prophetic word to me almost a year ago. Every time I make up my mind to begin, but there’s always a voice that says: where do I begin and what do I write. I know there is a resistance in this area but all I need to do is to begin. What I love is to see people healed emotionally through prophetic ministry and intercession. Please pray that the Lord will direct me in how to begin blogging. Thanks again for your empowering words. Hi Jamie! This read was extremely insightful and filled with God’s love all over it. This content is very helpful and I feel I have a much better idea of my specific calling to eliminate any doubt that I might of had. So powerful! Thank you for your obedience to his specific calling on your life. You’re a mighty daughter!!! Treasures in Heaven for you everywhere! God bless you! I really dont know how i stumble on to this, but i read all and said a couple of payers though it. i feel i have a starting point . i know he has a calling for me, and i cant wait to see what it is. Thank you for being there and keep strong for us. we need your words. Thank you.